Last week, Greg and I made dinner from complete scratch. He made the bread whilst I made the beef goulash soup to go with it. We followed it up with a delicious lemon meringue pie (will write another post on that). 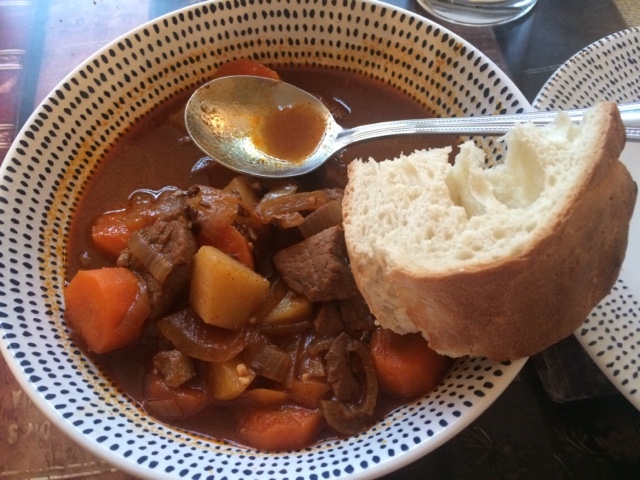 I really enjoyed the Beef Goulash soup and wanted to share it with you. I have also included bread recipe underneath incase anyone wants to go full out like we did and make both. (You won't need anything else with it as it is surprisingly filling). We halved the goulash recipe as there was only two of us for dinner. 1. Heat oil in a large saucepan over medium-high heat. Add beef and cook for a few minutes until it has been browned. Remove with slotted spoon and drain using kitchen paper. 2. Reduce heat and add the onions, garlic and celery to the pan. Cook until softened. 3. Remove pan from heat and stir in paprika and caraway seeds. 4. Pour in beef stock and measured water. Add bay leaves, Tabasco sauce and tomato puree. Stir well and add browned beef. 5. Bring to the boil, then reduce heat and cover partially and let simmer for about 30 minutes. 6. Add potatoes and carrots and simmer for another 30 minutes. 7. Remove and discard bay leaves and serve in warmed soup bowls with a dollop of sour cream, if wanted. 1. Mix the flour, sugar, yeast and salt in to a bowl. Add butter and use fingertips to rub until it looks like fine crumbs. 2. Pour in water slowly and mix with a cutlery knife until there is a stodgy consistency and the mixture isn't too sticky. 4. Lightly grease the mixing bowl with oil, put the dough back in and cover with a clean tea towel. Leave to rise until it has doubled in size. 6. Cover again with a clean tea towel and leave again until doubled in size. 8. Put on middle shelf and bake for 30-35 minutes. The bread should be easily lifted from a tin and sound hollow when the base is tapped. Leave to cool.